“'The pope has the right to freely resign. That’s what the canon says. The doubt is whether the situation Francis is in now really allows for a free choice because there is a political faction in the Church trying to force it,' said Nicholas Cafardi, former dean of Duquesne University School of Law." “'I don’t see how (the pope can resign freely) when you have people campaigning for it,' said Cafardi, who is also a former member of the Board of Governors of the Canon Law Society of America." If Kasper, Reuters and canon law expert Cafardi are right that it is "difficult, if not impossible" for a pope to resign "if a political faction in the Church if trying to force it" then Pope Benedict XVI probably, if not for sure, is still Pope which would mean Francis is not a valid or real pope. Was there "a political faction in the Church trying to force" Benedict to resign which put into "doubt... whether the situation [Benedict was] in... really allow[ed] for a free choice" as Cafardi said to Reuters? Was Benedict's stepping down "a forced resignation [which] would [make it] invalid" according to Kasper? Was there "a political faction in the Church trying to force" Benedict to resign? “Ratzinger [Pope Benedict XVI]... was very traditionalist and conservative... but he did important things. The things he did in relation to pedophilia, which was not much, but double the time for prescribing crimes in the Vatican, sent away almost 600 priests in a few years. The incredible thing is that Francis did a lot less." "... The story of the gay lobby has... importance in the Vatileaks and the dismissal of Pope Ratzinger... He destroyed the careers of those who were with them. To stop this group, a group of supporters of Ratzinger began to issue a series of documents, which was called Vatileaks... He destroyed the careers of those who were with them. To stop this group, a group of supporters of Ratzinger began to issue a series of documents, which was called Vatileaks. I can say this shock, this war of [Vatileaks] documents led to the end of Ratzinger." "... Ratzinger made... war against pedophilia... [h]e just started and resigned." "Cardinal Dario Castrillón Restrepo, who was an extremely important Cardinal especially during JP II's & Benedict XVI's pontificates, and was a key negotiator during several world crisis like the cold war, was interviewed by Colombian Television Channel "Caracol". The video was uploaded on youtube May 10, 2018 and Cardinal Dario passed away May 18, if I remember correctly. So, this interview was very timely, only a few weeks before his death. In that interview, Cardinal Dario admits that he was the one who had received a very painful letter "written in chinese" which urged him to hand-deliver the letter to the Holy Father (Benedict XVI). Cardinal Dario said the letter contained the most horrific threats beyong imagination. So much, that it was too much for the Holy Father to bear and for that reason, said the Cardinal, His Holiness Benedict XVI renounced. Cardinal Dario says Benedict XVI renounced only months after he read the letter. He mentioned that after he read the letter, both Cardinal Dario and His Holiness Benedict XVI vowed to keep it a secret between the two, but Cardinal Dario said that 'someone knew and told everyone.'" "So, the question about China being involved? Hmm..very likely?? FYI, the link to the video interview on youtube says the video is no longer available in our country (U.S.)"
What did the media report about this "2012 obscure threats after a trip to China of another prelate" and about that prelate: pro-gay Cardinal Romeo? The newspaper with "a reputation for scoops" II Fatto Quotidiano, Fittipaldi and Calabrò appear to be linking Vatileaks to strange happenings against Benedict. Were Vatileaks and the Vatican financial scandal as well as the Vatican gay lobby tied together as the causes that "led to the end of Ratzinger [Pope Benedict XVI]"? Apparently, Vatican expert Dr. Taylor Marshall says that if Archbishop Carlo Maria Vigano is telling the truth then Fittipaldi's inference appears to be true. If Vigano is telling the truth then the Vatican gay lobby paired with the Vatileaks financial scandal apparently caused Pope Benedict XVI's resignation and it appears that Pope Francis has "reinstated and promoted" all those who brought about the resignation. "First of, Vigano blew the whistle on money laundering." "Two, the accusations of money laundering leads to the Vatileaks scandal." "Three, the Vatileaks scandal leads Benedict to form a secret investigation with three cardinals." "Four, those three cardinals expose moral rot, sexual deviancy, that is paired up with financial irregularity." "This is what moves the Pope to resignation. And just to make sure there is enough pressure on him to do it and do it quick something funny goes on with the Vatican Bank beginning on January 1, 2013." "And it seems the powerful cardinals within Vatican City wanted it to happen fast because they don't want the 300 page dossier released to the public because there is moral scandal in those pages." "That binder was left with Pope Francis, but nothing has been done. And what we see is that those who were oppose to Benedict XVI theologically, but also on administration, have been reinvolved, reinstated and promoted." Here is more evidence that Benedict was forced or pressured to resign. "An article by Italian journalist Maurizio Blondet is making the rounds alleging that Pope Benedict XVI was blackmailed into abdication by forces allied with SWIFT (the Society for Worldwide Interbank Financial Telecommunication), which had a hand in the shutdown of ATM and bank card services at the Vatican in January of 2012." There was a blackmail of Benedict XVI, coming from who knows where, through SWIFT. The underlying reasons for this have not been clarified, but it is clear that SWIFT has intervened directly in the management of affairs of the Church..."
"...It strikes me as interesting that more attention isn’t being paid to the role played by Ronaldo Hermann Schmitz, the acting President of the IOR [Vatican Bank] Board at the time, given his ties to Deutsche Bank." "I mean, one would think that the former Deutsche Bank Executive Director, even if unable to leverage his contacts within the German banking giant to forestall such a drastic move, would have at the very least been well aware of what was coming and could have perhaps taken steps to secure the services of another financial institution, as happened in short order soon afterwards." "This leads me to wonder where Ronaldo Hermann Schmitz’s own interests may have lied as this was taking place." "Let me be clear; I have no information implicating Schmitz in any nefarious activity; I am simply making common sense observations and asking questions that, curiously enough, have apparently never been addresses by those in the media; in spite of the extensive coverage these events received." "In any case, one is still left to wonder what motivated Gotti Tedeschi’s removal." "Given that the reform of the IOR [Vatican Bank], for all intents and purposes, was all but halted while interim President Schmitz acted as caretaker until a new President could be found, one might assume that this interruption alone was the primary motive." "It seems rather clear for reasons addressed below, however, that the motive went well beyond simply protecting the interests of those whose financial improprieties Gotti Tedeschi was laboring to uncover, making it seem far more likely Gotti Tedeshi’s demise was undertaken in order to set in motion the events that would secure the abdication of the man who appointed him." "Circumstantial evidence strongly attesting to this being the case can be found in the fact that the Vatican reached an agreement with a Swiss firm to resume ATM and other bank card transactions effective February 12, 2013, just one day after Benedict XVI announced his intention to abdicate. Indeed, as far as I can tell, nothing of note had changed between the cessation of bank card operations on January 1st and their resumption on February 12th relative to the Vatican Bank’s compliance with international banking standards. Rather, the only noteworthy thing to change was the status of Benedict’s pontificate." Cardinal Walter Kasper is sweating like a crocodile in a purse factory, folks. He should be. The Bergoglian Antipapacy, a Walter Kasper Production, is hurtling towards its end. Did you see Maike Hickson’s reportage at LifeSiteNews that Kasper is now saying that a “forced resignation” of Bergoglio would be invalid? The unmitigated gall of these people…. I’m telling you, folks, things are happening. First, to review, Antipope Bergoglio holds no juridical office to resign from. As we have discussed many times before in this space, “Antipope” is NOT an office, it is a CRIMINAL STATUS. Antipope Bergoglio can’t “resign” the Antipapacy any more than O.J. can resign from being a murderer. Second, anyone with two brain cells to rub together can see that Pope Benedict was under pressure to “quit”. The Sankt Gallen Mafia, led by Cardinal Carlo Martini, told Pope Benedict in ARSH 2012 that his “time was up”. Martini died on August 31, ARSH 2012 and Walter Kasper became the head of the Sankt Gallen Group. Not long after on December 31, the Vatican was cut off from processing credit card transactions, a block which was **miraculously** lifted on February 12, the day after Pope Benedict announced his attempted partial faux-resignation. The question of “forced resignation” has exactly ZERO to do with Jorge Bergoglio, because Jorge Bergoglio is not now and never has been the Pope. Jorge Bergoglio is as much the Pope as I am. You can’t resign an office that you never held. The sentence, “Jorge Bergoglio resigned the papacy” is EVERY BIT AS NONSENSICAL as the sentence, “Kim Kardashian resigned the papacy.” Jorge Bergoglio only needs to be PHYSICALLY REMOVED. That’s it. No trials, no resignations, nothing. Just give him a change of clothes, and send him packing back to Argentina. There are few historical figures in memory even after 500 years, friend or foe, who were as influential as Martin Luther. In the course of 500 years Martin Luther was viewed in many different ways: Luther as a reformer, Luther as a church father of Protestantism, Luther as a champion of reason and freedom, Luther as a brave German national hero, and many other images assigned to Luther. For Catholics, Luther has long been one of the heretics par excellence, and responsible for the split of the Western Church and its consequences-at least up until today. This thinking is now over. The Catholic Luther research in the twentieth century brought a significant shift in understanding Luther. Luther is now recognized for his insights and there is a more equitable judgment on the schism. There is now more of an understanding and ecumenical spirit. 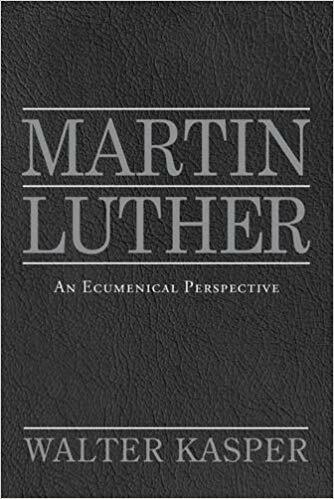 Cardinal Walter Kasper carefully presents these themes in his latest work, explores his understanding of Martin Luther and his contributions that could not be imagined 500 years ago, but are now in the forefront of a new ecumenical spirit. Various chapters in this book speak of the end of the confessional age, Luther in the spirit on modern times, ecumenical discovery of catholicity, and an ecumenism of charity. Antipope Bergoglio sounds like a Lutheran because he is parroting what his puppetmaster, Kasper, tells him to say. Kasper is a Lutheran. If you read J. Michael Miller’s dissertation, you will understand what the agenda is and has been for over 50 years among the Germans: dissolve the Papacy by “fundamentally transforming” the papacy into a “collegial, synodal shared Petrine ministry”, Lutheranize everything. And as a bonus, get a cut of that sweet, sweet Lutheran Kirchensteuer money. The Freemasons giggle with glee, and satan squeals with delight. I am not convince either of them are Pope. But if I had to bet money on one of them it would be Francis, since B16 resigned and 11 months later confirmed to the press that speculation about his resignation being forced was nonsense. B16 behaves like a retired Pope. He has had almost 6 years to tell us the truth and we have heard nothing. So I reckon he resigned because he wanted to resign. First forced resignation goes back to Cardinal Siri being blackmailed to step down so they could install Roncalli. I think the Resignationists will become the new "Paul VI is still alive" group when Bennie dies.